Everyone of us are very much aware of including grains in our diet. So making them colorful and tastier is very important right. Today I am posting a simple and tastier pilaf using quinoa. Other than making salad in quinoa this is quiet wonderful option of making pilaf too. I have used black quinoa but you can adopt same with white and brown too. Happy healthy eating!!!!!! 1. Wash the quinoa well. Now boil the measured water in a open pan. 2. Add the quinoa and little salt. Close with the lid and let it cook until all the moisture is absorbed. But keep in the low flame. 3. Heat oil in the pan , add the slice onion, followed by ginger garlic paste. 4. Then add tomato followed by green chilli and vegetables. 5. Saute until the vegetables are cooked, dont over cook it. 6. Now add the quinoa. Add salt and lemon juice. 7. Mix well so that everything has to be blended well. Serve hot with raita or plain!!! This black quinoa has unique fragrance. Iam a fan already......looks colourful.I have never seen black quinoa very new to me.Does this come in various shades? 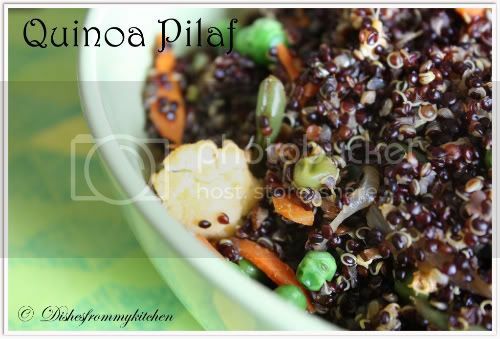 Pilaf sounds great with Quinoa, very healthy indeed. Pilaf with healthy quinoa, nice looks really good. 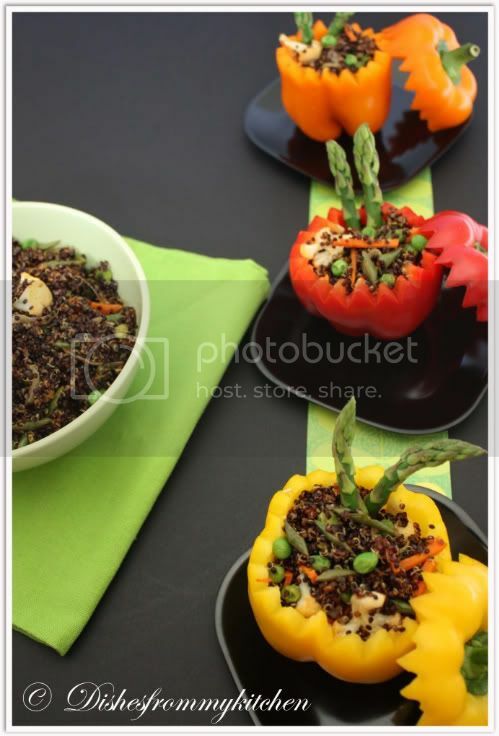 love the black quinoa...pics look yummm-ooo! Nice Quinoa Pilaf. I like the black ones better after seeing it here. Looks great and I bet it was flavorful! wow.This is very new to me .Looks very tempting. Super clicks too. Absolutely perfect - love the spring colors. This is one healthy thing that also looks gorgeous and I'm sure tastes even more gorgeous! My pranams to your creativity! I know there are so many quinoa recipes and still when some one asks me for one I am always thinking about where I read about it, so I am book marking your recipe. 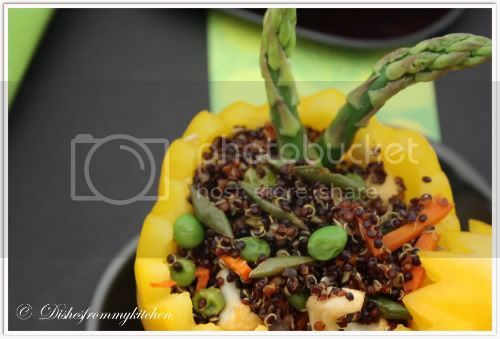 I have never cooked with quinoa before but your dish looks healthy .Beautifully nad creatively presented and amazing clicks. this sound interesting, and it look very colourful! Looks colorful and interesting. But quinoa is something that I have never heard of. Does this belong to the Kambu family??? Lovely presentation pavithra...quinoa is very new to me, but very interesting recipe. I've never heard of Quinoa accept here on blogs, but this does look very interesting especially with your wonderful presentation ! Nice presentation & super pilaf!! wow.. this looks so delicious and such a wonderful presentation as always! i make a similar pilaf but with white quinoa. I find the red quinoa a bit hard to find, but it looks so beautiful. Such a healthy pilaf recipe Pavithra. Looks colorful! Wat a heamthy pilaf...Black quinoa looks cute and new to me..never seen them still today..
wow! 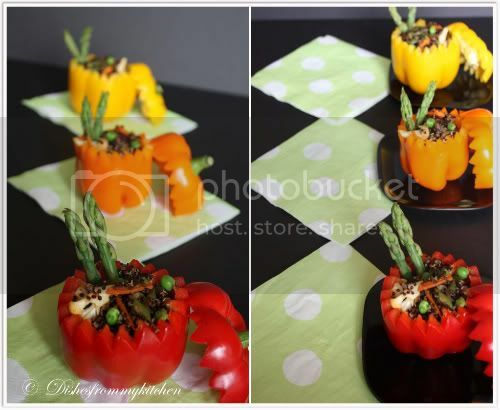 healthy recipe ...presentaion is mind blowing! Lovely dear! never tried using Quinoa... looks interesting! Hi Pavithra, hopping here after a long time, I have not seen this grain but heard a lot about it. I am sure it tastes good and so well presented dear. Lovely presentation..colourful and so pretty!.. 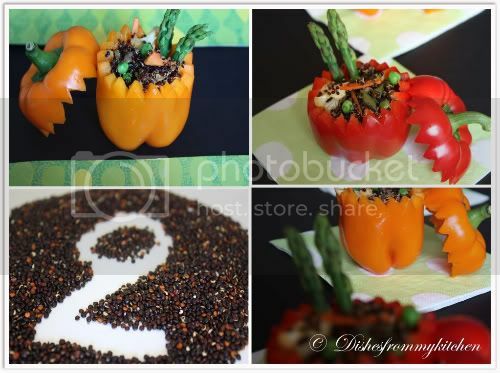 Beautiful presentation Pavithra... Love this quinoa pilaf... looks so yummy and very tempting. 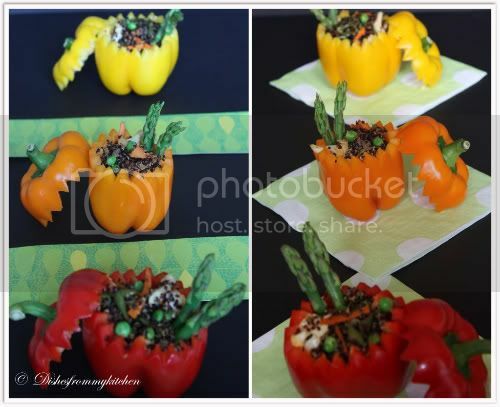 Love the capsicum bowls. Loved the presentation part. But above all an interesting recipe. Lovely colorful pilak! Fantastic presentation! Looks amazing. Very nice recipe and nice click. hi pavi, all ur dishes are mouth watering, just to inform u that in ur blog chats ragada patties not working.